This post has been a long time coming. I have had my 32GB 3g iPad for a little over a week now about a month now. Every time I take it out I get "the look" and then someone asks if they can play with it. I have also noticed that anywhere I pull out my iPad I gets looks not because I have one, but because I am a woman with an iPad. I have had people comment that they didn't expect a woman to want one! My only response was, "Seriously?". I know the stats are out that only 34% of iPad owners are women but I didn't expect someone to say something. 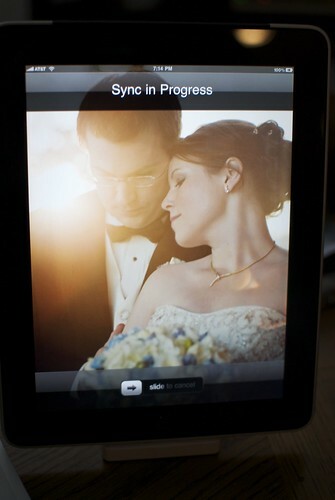 I only have one complaint about the entire iPad: the Glare. It is actually starting to get on my nerves a bit. The reflection on metro, in the office, and about anywhere there is overhead and light coming in from outdoors means is a problem. It doesn't stop me from loving and using the iPad but it is something they should work on fixing. When I brought this up to my husband, he brushed it off. The glare doesn't bother him (or he doesn't want to admit that it does). The picture slideshow. I know this is super simple and I could have saved a lot of money JUST getting a digital picture frame, but it is nice to have one at my desk. When I am sitting in my cube I have the slideshow going. So far, my coworkers that have stopped by my area love it. My goal is to make the iPad like my old Trapper Keeper (who knew they still make them?). I want my iPad to have ALL of my projects, presentations, and anything I do at work and life in general on it and organized. I still haven't found the best productivity app for me yet, but I am slowly narrowing them down. 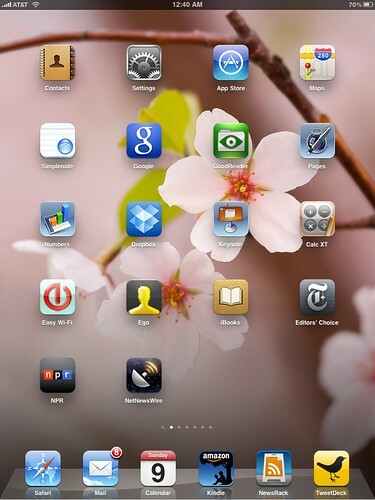 iPad went on its first business trip last week and having the Keynote app was priceless. There were three of us giving a presentation to a large corporation. I didn't use the iPad to display the presentation but we did use it on the sidelines when we weren't presenting. We were able to scroll ahead in the presentation, remind ourselves of the notes and just feel more prepared. Yes, this could have been achieved with a printout but those make noise and are obvious. It just worked better having the iPad there. Last week I had to fly home unexpectedly. While I was at my parents house my ENTIRE family played with my iPad. For the most part, before anyone would touch it they would just stared at it. My sister on the other hand, actually asked to play with it. After a few hours of playing with my iPad she must have been hooked because she ordered her first iMac and iPad this past Saturday! After years of trying to get her to get a Mac, it is the iPad that hooked her. My mom is looking at how she can use the iPad for her home-based business too. My little five year old cousin loves the iPad because he can kill zombies on it (so easy to impress). Both of my grandmothers like how easy it is to view pictures in the slideshow and scrolling through the app. Everyone loves it, not just because it provided a distraction from why we were all there, but because it was easy for the entire family, from 5 to 85, to use. Well, these are my first thoughts on living with an iPad. The first month has gone well! I did forget the mention the AWESOME battery life. I can go days without charging. I love my iPad.